This is a big week in the comic world. Not only is Free Comic Book Day this weekend, but Marvel’s latest event, Secret Empire, officially starts this week! 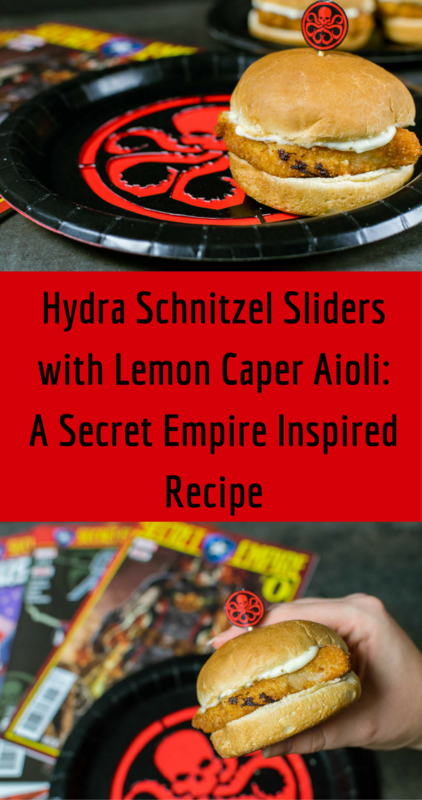 To mark the start of Secret Empire, we have created a recipe for Hydra Schnitzel Sliders with Lemon Caper Aioli. 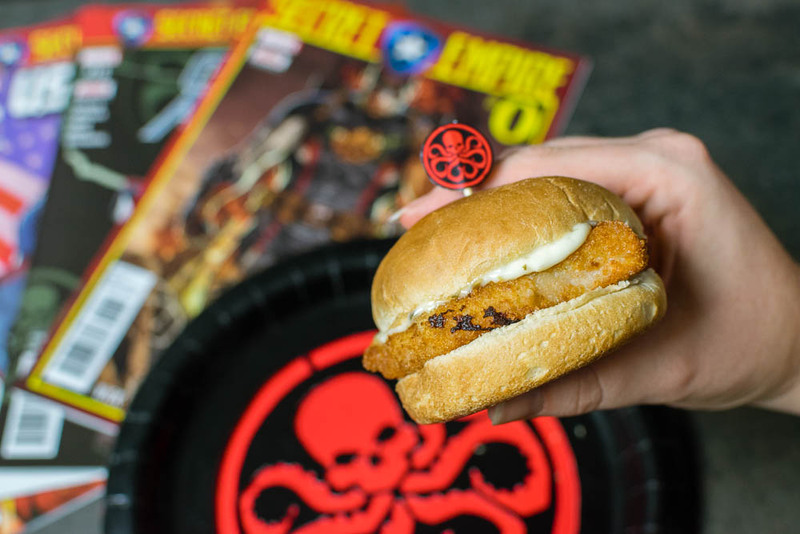 These sliders are easy to make and so delicious that you might even join Hydra to get your hands on them! 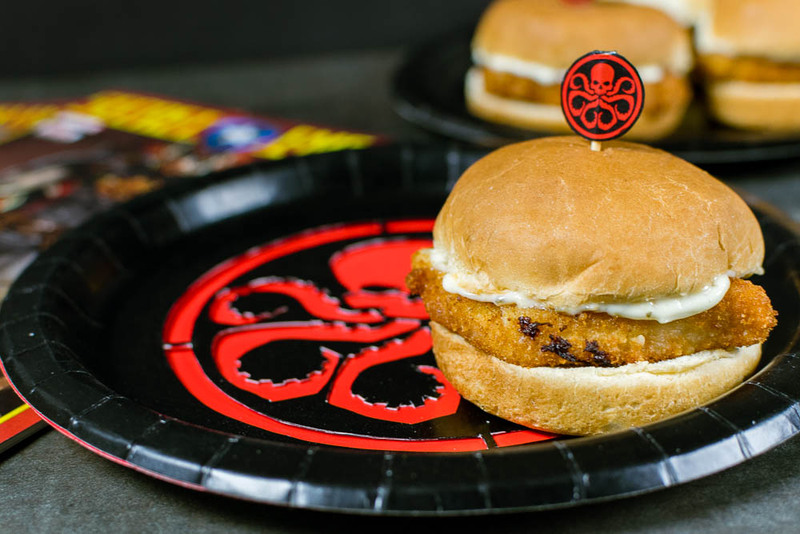 As for our recipe, we were inspired by Hydra. We wanted to create a German-style recipe. However, we wanted to create something that was a bit more fun than a traditional full German meal. This is where sliders came into play. We took a traditional schnitzel and turned it into sliders. Typically schnitzel is served with capers and lemon, this served as our basis for the aioli. We are super excited to read these comics and we hope you enjoy making this recipe! If you are in the Phoenix area, Fantastic Worlds Comics is hosting a Secret Empire Launch Party on May 3rd from 11 am to 7 pm. They will have a scavenger hunt, raffle, and more! We will also be there at some point during the day so stop by and say hello! Combine aioli ingredients and refrigerate for at least an hour (if you have time to make it the day before it will be even better). Meanwhile, dredge the pork in the following order: flour, egg, bread crumbs. Once oil is ready, fry pork for 2 minutes on each side. Don't crowd the pan. Once cooked, place pork on paper towel to drain excess oil. While pork cools and rests, prepare each bun with aioli. Place one piece of schnitzel on each bun.